Local housebuilder, Story Homes, and The Cumberland building society have teamed up to offer a seamless customer journey for Cumbrians who are looking to buy their own property. The two local businesses have worked together now for several years and both companies provide a personal, bespoke service that creates a distinctive experience – positively setting them apart from competitors. In simple terms, Story Homes builds the high quality houses, and the mortgage products from The Cumberland enable customers to buy them. Mortgage advisors from The Cumberland regularly attend Story Homes’ show home openings and development launch events, offering help and advice to those who are considering buying a new build home. Similarly, the building society has helped Story Homes to host a number of mortgage advice events across the county, where customers are able to openly discuss any mortgage queries with The Cumberland’s knowledgeable advisors. Hayley Blair, Head of Sales for Cumbria and South Scotland at Story Homes, said: “We have developed a strong working relationship with The Cumberland and it has been great to see two local businesses supporting one another to offer an efficient service for customers. Both businesses share similar values when it comes to corporate social responsibility and supporting the local communities in which they operate. The two Carlisle businesses do their best to be ‘good neighbours’ and each year they provide support for a number of causes – including local charities, neighbourhood groups, schools and voluntary organisations. In total, the two businesses have donated more than £150,000 to the local community this financial year. Andrew Gordon, head of relationships at The Cumberland, said: “Our customers come first and will continue to be at the forefront of the future of both businesses. "The reason that the partnership works so well is because the two businesses share the same goal – helping people to purchase their dream home. Story Homes has a range of incentives to meet the individual requirements of its customers, such as Help to Buy, the HOME scheme and Part Exchange. Whether buying a first home, moving to a new one, looking for a better deal or investing in property, The Cumberland also has an award-winning range of mortgage deals to help customers – from first time buyers to those who are retired. 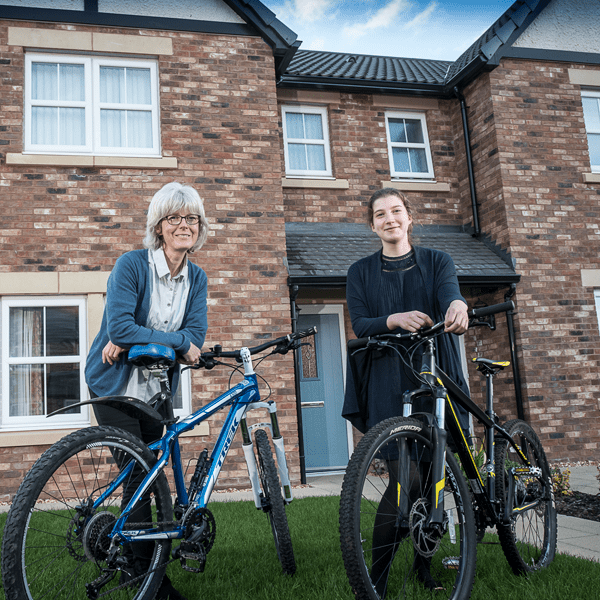 One person who has benefitted from the partnership between Story Homes and The Cumberland is customer Catherine Lyall, who moved into her new Story Home in Thursby earlier this year with her daughter, 17-year-old Holly. The pair moved into their three-bedroom semi-detached home at St Andrew’s View in March. Their new home is convenient for Holly’s school, Nelson Thomlinson, and they have been enjoying life in the local area, including cycle rides out into the country. Catherine said: “We love the area as it is nice and central for everywhere. The development is fairly small and our house has a lovely view across the fields. "I like the convenience of being in a new home where everything is built to a high standard and you know that if anything happens to go wrong it will be addressed." “I have been a Cumberland customer previously and I already had my mortgage with them and so transferred it our new home. For more information visit Story Homes.